How do earth features influence where people live? What policies should guide our use of earth’s resources? How should we dispose of nuclear wastes? What kind of space exploration should we undertake in the future? 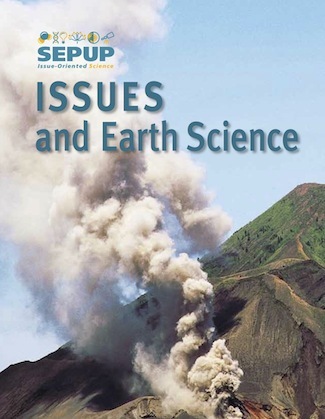 The science behind these and related issues are explored by students in Issues and Earth Science, part of a three-year comprehensive SEPUP science series for the middle grades. Like its companion courses, the program uses societal issues and problems as themes for the study of earth science. It is standards-based and can be used alone or in combination with other SEPUP courses. Like all SEPUP programs, it features an activity-based approach and is available with a complete equipment kit that supports up to 160 students before consumable replacements are needed. It features a nationally acclaimed assessment program and an embedded approach for supporting literacy in the science classroom. Students study the properties of different types of soils in the context of preparing a school garden. They investigate soil profiles, organic and inorganic components, use of fertilizers, and soil mapping. Students investigate properties of rocks and minerals as they consider questions related to use of our natural resources. Physical properties of individual specimens, such as luster, hardness, and color are investigated, as are main rock types — sedimentary, igneous, and metamorphic—and how rocks change from one form to another in the rock cycle. Students investigate the destructive forces of wind, wave and water on landforms as they decide where to build homes. Stream tables and topographic maps are used, respectively, to study river action and deposition of sediments, and landform contours. Students explore the structure of the earth—the core, mantle, and crust, and learn how the slow movements of large plates of the earth’s surface help shape its features, including continents and oceans. They investigate earthquakes and volcanoes as they examine plans to deposit radioactive wastes in areas of relative seismic stability. Students investigate local and extreme weather conditions, climate and rainfall patterns, wind, the water cycle, and examine the root cause of weather and climate, namely the distribution of solar energy over the earth. Wind and the atmosphere are studied in depth. Students study the earth’s rotation, the causes of the seasons, shadows, movement of the moon, actions and causes of the tides, and review several calendars developed over the years to mark the passage of time. Students explore the earth’s role in the solar system, our planetary neighbors, the night sky, gravity, remote sensing, relative and absolute distances, and issues in space travel.